Golden Kamuy has given us a variety of different ways to teach us how to survive through the use of hunting, crafting, and foraging techniques. As the race to uncover the location of the treasure and unlikely alliances are being forged, these survival techniques that we’ve learned so far are not the only ways that the many characters of the series have to use to survive. 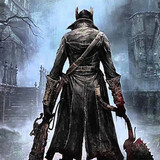 With different groups all looking to obtain the treasure, there’s a psychological edge needed to survive everyone else’s cunningness and potential manipulation. 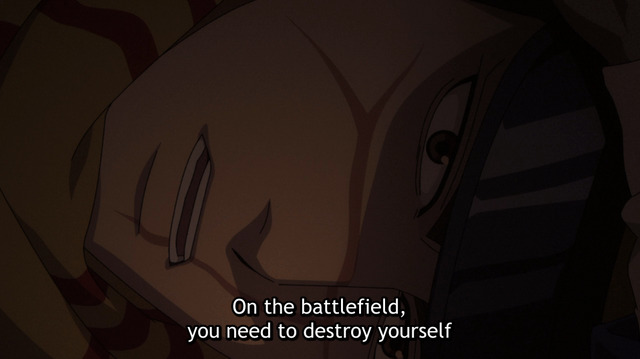 Having seen Sugimoto address this in a recent episode, how have other characters utilized crafting new personas of themselves in order to gain an edge over the others looking for the treasure? 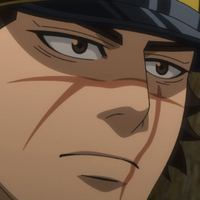 In episode 17, while Sugimoto and Asirpa taking shelter from the storm, Sugimoto discusses his past in the war and how, “on the battlefield, you need to destroy yourself and become someone else if you want to fight.” In order to survive the countless battles, each country’s soldiers had to become someone else, see the enemy as less than people, and block out the idea of killing countless people. 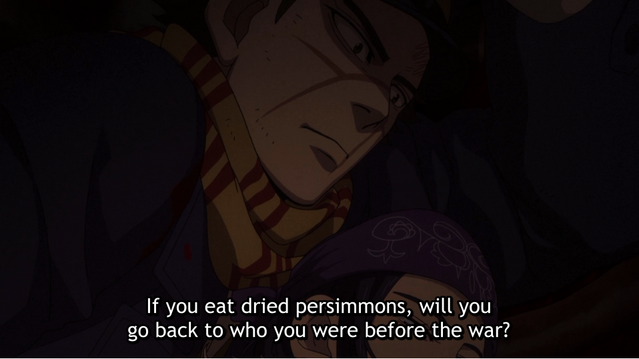 Asirpa asks in this scene whether those people are able to go back to their original self after the war and Sugimoto responds that some can and some can’t. There’s a very poignant shot of characters that we are familiar with from the 7th division when Sugimoto discusses how those that can’t go back to their old ways have their hearts still on the battlefield. Missing from that shot is Sugimoto, who you might expect after he reminisces about his pre-war life. After Asirpa asks him if he’ll go back to the way he once was, he becomes emotional, regretful, and knows that he can’t. Nothing will ever go back to the way it once was. Not for Sugimoto, not for his friend he promised to help, not for the soldiers, and not for the country. The new self is now the self and their old personas are gone. Yet, at the same time, having the persona of the Immortal Sugimoto means this doesn’t break him. Or maybe, this version of him can’t be allowed to break. Whether it’s physically as we’ve seen throughout numerous fights and encounters or mentally here. Breaking in any way would be counterintuitive to being this unkillable and undefeatable person that always handles the tough tasks. However, this empathetic side of Sugimoto is key to who he is as a person. The goal of helping his friend and using the treasure to accomplish that task has been something we’ve known since the beginning. Meeting Asirpa has only strengthened his resolve of helping people he cares about which has also shifted his Immortal persona from when he was in the military. He’s no long immortal to ensure his own survival, it’s to help make sure everyone else can survive as well. Sugimoto will put himself into harm's way to make sure his group is safe. This new version of the Immortal Sugimoto is the way he knows how to survive in this tumultuous search for the treasure. Most of the characters in Golden Kamuy have had a choice in their change in persona. They get to decide how their new self is going to be, whether that's good or bad. Sometimes though, you can undergo changes and have no say in the matter. In that way, you'll have no way of knowing who exactly your new persona is going to be. There’s perhaps no character who has undergone a transformation like Lieutenant Tokushiro Tsurumi. He certainly has the best reason to have undergone changes with who he is due to the injury he received during the war. Head injuries can be a strange beast. Sometimes a person can sustain one and nothing about them changes. Other times, insignificant injuries cause the most damage. Tsurumi’s injury wasn’t insignificant, but it has caused a lot of damage that he still deals with. The metal plate he wears shows the after effects of his wartime injury, but it has also caused him to change to become more violent. 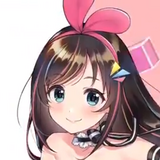 Which is to be expected. 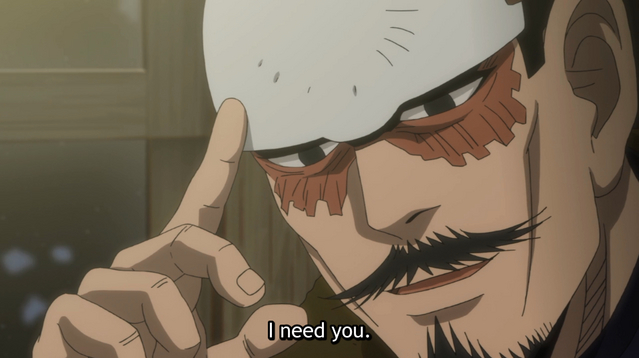 A head injury of that nature is going to cause some long term complications, yet Tsurumi has taken what some might deem to be a disadvantage and turned it into a strength. This post-war version of Tsurumi has become more ruthless in his nature to find the gold and exact revenge against a country that he feels failed him and his fellow soldiers. He had to change due to the nature of his injury, but he has adapted and persevered. It’s one reason why the 7th division are so dangerous in their hunt for the gold. Tsurumi isn’t afraid to get his hands dirty or go to extreme lengths to make sure he gets what he wants. How many people are willing to befriend a human taxidermist to obtain what they need? When you want to win by any means necessary, you will go to those lengths and Tsurumi will do just that. Would he be like this without the head injury? The injury certainly intensified the situation he was in and pushed him further into his hate for the Japanese government for what happened in the war. Damage to the brain can cause personality changes such as these, but it’s also possible that he still could have been manipulative if the injury hadn’t occured. If that were the case, he might have had to adapt and change in a different way than what he currently has. Sometimes, Golden Kamuy shows that former members of the 7th can change in ways that takes them away from a lust for violence and revenge. Genjiro Tanigaki is one such person. After joining the army just to find out where his sister’s killer had disappeared to, he eventually finds him and realizes exactly what happened in an emotional scene. It changes his purpose in life from revenge to trying to figure out what exactly he was doing with his own life. An injury he sustains in an early encounter with Sugimoto helps him to find that purpose. Following his time with the Ainu who helped to treat and heal his wounds until he was back on his feet, he decides to help them by helping Sugimoto make sure Asirpa is able to come home safe and sound. By this point, Tanigaki has significantly changed. Gone is his revenge for his sister’s killer. Gone is how lost he is. He now knows what he wants to do. 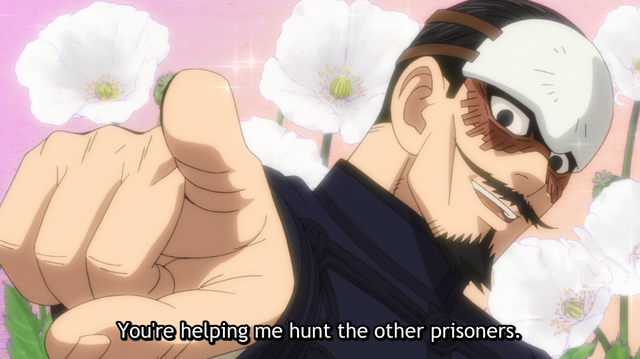 Even if it is as simple as just giving back to those that helped him, it is a significant change that helps, gives a new purpose, and makes Tanigaki have a reason to survive. Yet, there are some former members of the 7th division who went a different route from Tanigaki and Tsurumi. Enter the cold, calculating, and dangerous Hyakunosuke Ogata. With Ogata, there lies an intriguing question: has he really changed? With what we know with regards to how he killed his own father thanks to the encouragement of Tsurumi and is still as calculating as ever, it might seem as if he hasn’t. 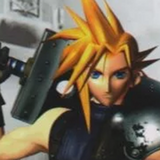 However, these changes are not as clear and easily seen as other characters discussed so far. Despite being egged on by Tsurumi to finish off his father, he doesn’t stick around and stay with the 7th. Instead, he comes into contact with the third group chasing after the gold and Toshizo Hijikata and joins them after beginning to question the ideals of Tsurumi. Hijikata welcomes him with open arms and that allows Ogata a new group to utilize his strengths in marksmanship. It doesn’t change how quiet he is with regards to group dynamics, but he still has changed from his time in the 7th. 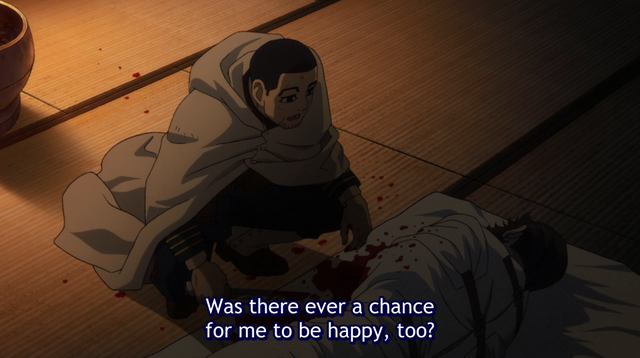 Abandoning Tsurumi allowed Ogata to see that he didn’t need the charismatic leader to survive in this post-war world. Nor does he need the strength of the army in order to achieve his goals. He can go wherever and knows his talents will be accepted by people who see them. If anything, leaving the 7th has made him even more cold and calculated as it has increased his confidence in himself and shown that people need him more than he needs them. With the nature of survival, it’s important to know how to be able to eat, have a sturdy camp, be alert, and stay warm in the wilderness. Those are all valuable aspects that Golden Kamuy has shown throughout the series. At the same time, it’s just as important to show the psychological nature of survival between three rival groups who are all hunting a treasure. 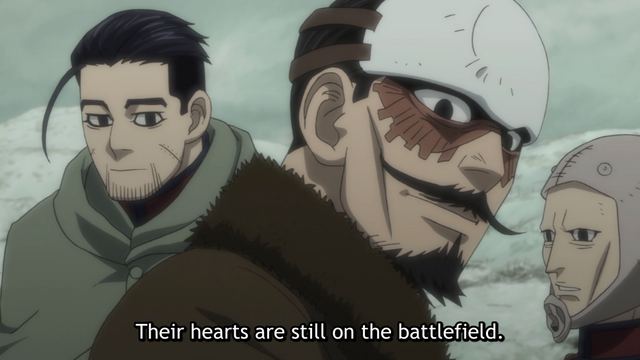 Characters such as Sugimoto, Tsurumi, Ogata, and Tanigaki show that Golden Kamuy has smartly implemented and pushed that form of survival as well. 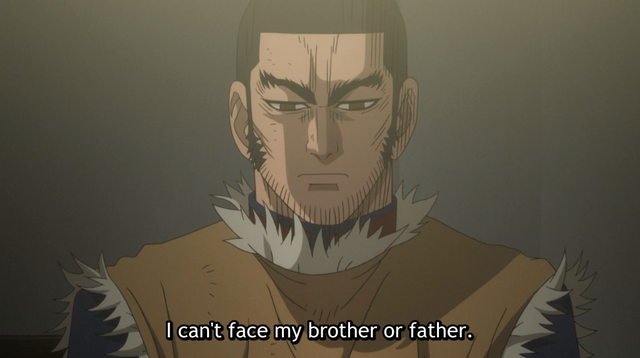 You can be a great hunter and gatherer, but in the world of Golden Kamuy, it’s also important to keep your head on a swivel and surround yourself with people you can trust to maneuver through the psychological aspects of survival. Who has been your favorite character to see change throughout the course of Golden Kamuy? Let us know down in the comments below and especially if they're a character not mentioned! Anime Recap: Mob Psycho 100 Season 2 Trailer, My Hero Academia in 4D, & MORE! Experiencing the Magic of Kingdom Hearts III at Disney Springs!